Social Gaming is one of those things you love or hate. There seems to be no in between. There are people on Facebook who say they don’t care about your Farm, City or Aquarium. While others have tons of postings about their favorite games, about 40 status updates in a row. I know this because, yes I have played some of the games. It’s like social media, you have go participate and learn first. 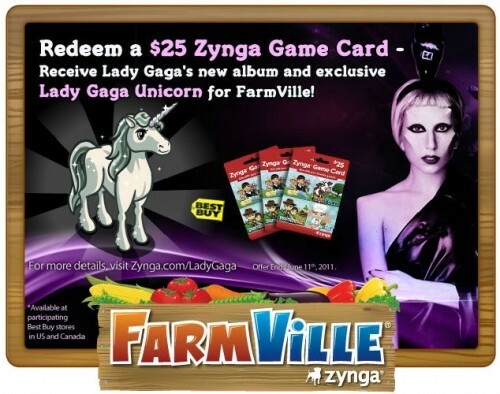 Mashable did a great infographic a while back that showed the user of Farmville by Zynga. For those of you not in the know, Zynga has created many social games. They include Farmville, Mafia Wars, Cityville, Frontieville, Yoville and more. Here are some stats about Farmville, Their biggest game till the just released Cityville. This is a very big market that I think many people are missing. Gaming is one of the areas, as marketers we over look. We tend to think of traditional and online as the ideal advertising mediums. In fact, Inside Facebook has a spin off site to just cover social gaming called Inside Social Games. This is proof that this medium is growing and growing fast. McDonalds gave gamers a blimp with the McDonalds Logo for liking certain items on the game. They also sold limited edition items in the Farmville store. Such as Dairy Barn, Café and more with the McDonalds logo on them for people to buy. Farmers Insurance gave a signature blimp to all players. While they had the blimp on their farm they had protected crops and they would not wither for 10 days. After that the blimp is just a decorative item. American Express did something similar to Farmer’s Insurance. 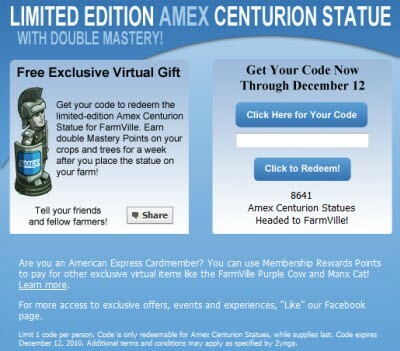 If you got an American Express statue and placed it on your farm you got double Tree and crop mastery points for a week. This was on top of allowing AE members to redeem points for Farmville Items. Bing! Wanted to increase its Fan base on Facebook. 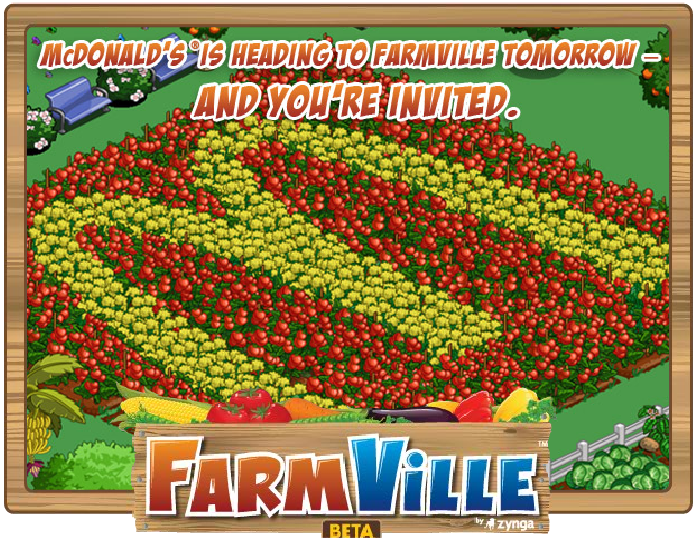 So they teamed up with Farmville and if you “liked” Bing you got three Farmville Cash. Which can be spent in the game on items. These four companies have seen a value in social gaming and it has increased their branding awareness. The current number of people playing Farmville is, according to the Mashable graphic, is 60 Million. That means you have 60 million people seeing your items in the game on a daily basis. This is even after the promotional period is over. Many players keep the items and leave them on their farm. This will continue expose consumers to the campaign. There is very few advertising that has a shelf life that could be months or maybe even years. Zynga has created a long page of advertising guidelines. They obviously feel that advertising will increase as we go forward. Simply by giving players and item and offering double points or anti crop wither, be welcome by players and not seen as an intrusion. As the social gaming grows there will be more potential for advertising. Social Gaming advertising is more like social media. You don’t want to push a product, you rather engage. This was accomplished great by Farmer’s Insurance. They gave farmers/players piece of mind that if they forgot to harvest their crops it would be safe and not wither. It very much matches what they do in real life. Matching your company/clients business with something in the game is one of the keys to advertising in social gaming. It creates a connection in the players mind and they will know what you do. This is especially helpful if you are a new company. I think the whole gaming industry is something we need to take a look at closer. This is especially true for branding campaigns. If you were a newer brand it would be a great way to get your name out and for people to look at your site and or goods. As marketers we should look outside the box to reach consumers. The old way of doing advertising is not dead but it is definitely changing. This is one area I think will only continue to grow over the next few years.